I once had a pair of bright pink earrings that dangled from my ears and sometimes touched the sides of my neck if I tilted to look upwards. Each had a long stem with a delicate bud attached at the end. I always wondered about the kind of flowers those buds would blossom into if they were for real, their flowers would look so beautiful, so stunning. I found the answer after 25 years. A walk through Gardens by the Bay, Singapore, revealed to me the inspiration behind the pair of earrings I wore as a teenager. My Singapore tour package revealed to me some hidden gems of this Lion City. Dangling from perfectly straight bright green stems, the buds of the dark pink fuchsia plant were a hit with the constant stream of tourists within the Cloud Forest. People craned their necks to take in the 35 metre tall man-made mountain with vertical walls of begonias, orchids, ferns and ominous carnivorous pitcher plants arranged wonderfully each on top of the other. I touched the delicate buds and looked for the flower. A stunning blossom with a tubular stalk, the flower of the fuchsia plant borrowed physical traits of the rose, hibiscus and lotus and angled down like a shy bride. A couple of clicks later, I moved on. 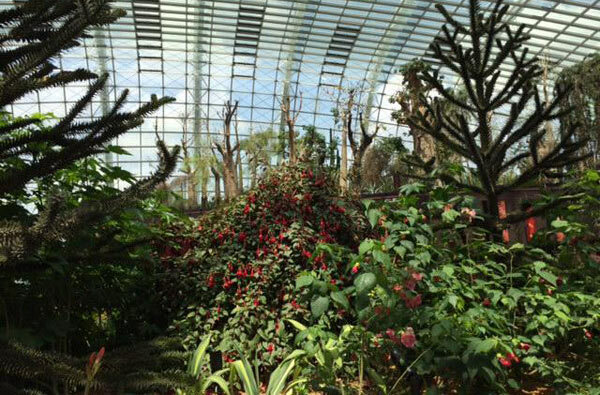 The Cloud Forest is just one of the numerous attractions at Singapore’s splendid complex of waterfront gardens, easily accessible by cabs, trains or buses. Spanning 101 hectares, Gardens by the Bay threw its doors open to the public in 2012. With about 380 varieties of plants, it is known for its many architectural wonders, mainly the Conservatory, which nurtures plants from all over the world, the Supertrees Grove – some embedded with environmentally sustainable functions like photovoltaic cells to harvest solar energy, and a suspended 128 metre long walkway between two Supertrees that offers a bird’s eye view of the gardens and Marina Bay, which lies at the southern tip of the island city. Apart from plants and a man-made waterfall, Gardens by the Bay has a number of cafes and restaurants that serve an eclectic array of food. European, Asian and Italian cuisines offer delicious choices for vegetarians. For those looking at Singaporean delicacies, the Majestic Bay Seafood Restaurant offers classics like Chilli Crab, Black Pepper Crab and Peking Duck. Though Singapore is notorious for its unstable climate with the hot sun quickly replaced by stormy clouds and heavy rains, flooding or chaotic traffic jams are uncommon in this little nation. It’s not very unusual to find Singaporeans shielding themselves with umbrellas or walking around with prams that are fitted with tiny fans to keep their babies cool! Most shops sell ponchos for those unaware of the unpredictable weather. The day ended perfectly with a spectacular display of lights from the Supertrees that dazzled the night sky. I did look back at the Cloud Forest but didn’t have the heart to pluck the buds that reminded me of my teen years. How brilliant their blossoms would be! The best part of visiting Gardens by the Bay is that it is free. So even if your Singapore tour package doesn't include it, you can explore it on your own.